Are you familiar with the page Humans of New York and Humans of Willemstad? Well, I took the concept and bring my own little twist to it. Here I pick people of my choice and ask them a few questions. The interview will last exactly 10 minutes, and I ask them as much questions as I can. Magazines usually put local celebrities in the spotlight. I believe that everybody deserve a chance to be in the spotlight, because we all may be doing something that makes a difference in the lives of others. The goal here is to get to know deep thoughts of our people a little bit more. My questions are tough….so get ready! Members are not allowed to use this group for free advertising! 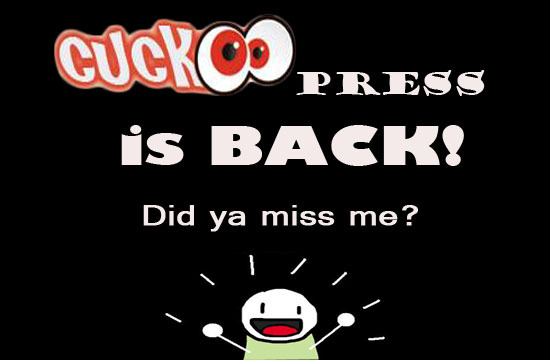 If you want to advertise on CuckooPress, see section Advertising for more info. All members are required to have pictures on their profile, or you will be (r)ejected from the group. Now you can place ads on CuckooPress website, page and our group. Please refer to the Advertising page for more info! CuckooPress is a free blog for everyone, however, it takes A LOT of time to write and share articles. If you think my effort has made an impact on you or your life, you can show your gratitude with a contribution so I can continue writing quality content for you to enjoy! Students between the age of 12 and 21 can contribute with a minimum of Fl. 1, – per month (Fl. 12 per year). You will have to show a written proof that you are an active student. You contribution comes with a membership. Click here to sign up. You membership will give you access to premium articles as well as your participation in cool gift raffles that will start soon! Contributions should be deposited to bank account MCB 1654.03.09. Send a copy (printscreen) to lionel_326@hotmail.com. Once the fund is received your membership will be authorized, and you gain access to all contents and automatically participate in periodic raffles! Click here to read more on why you should become a member!